This is pretty much the type of eye shadow palette, I was looking for! Smashbox's Full Exposure Eye Shadow Palette gives you shimmering shades, that are not too shimmery. An assortment of mattes in chocolatey browns, beautiful beiges and creamy creams. There's also a nice pop of blue! I don't usually do blue, but I think I can work with these two shades. HaHaHa No chalkiness here! This palette delivers! The top row is all shimmer (S1-7). The bottom row is all matte (M1-7). Smashbox gives you 14 shades in total and they are gorgeous. This palette has a mirror (sorry I cut it off in the picture HaHaHa), double-ended eye shadow brush and they give you a free sample of their Full Exposure Mascara (which I'll test and review at another time). They even give you an eye chart! It shows various eye shapes and how to apply eye shadow based on your eye shape! Isn't that neat? On the same chart they give you your best look for day, night and defined. I see myself using this more (everyday makeup), than the other ones. I purchased this in December at the annual Sephora sale, Smashbox has since introduced a Double Exposure Palette. However, this one is more of what I needed. Stop by Shireen, of Reflection of Sanity's blog to read her review on this palette. She's one of my partners in crime when it comes to testing beauty products! HaHaHa I love her because she tells it like it is (like me) and she's funny. One more eye shadow palette tomorrow you guys! I'm attracted by the shiny palette! Great review! I like the fact that there is a "construction advice" in it, quite cute! I saw this product no joke online and I said to myself nah now is yeah thanks to you. Great review. I don't use blue either, because I always look like a beaten boxer, but maybe a tiny line instead of eye-liner will work just fine. It's nice to have a chart, if you don't know exactly what's the perfect way of applying to your eye shape. I really like this eye shadow palette! This looks great. And you are right, there is no chalkiness. The biggest problem I find with blue eyeshadows is that they can be chalky. I think I love the shimmer ones the best, but it's nice to have the matte option. This pallette seems like a dream! Those are nice colors and chalkiness always turns me off, so it's nice that they have good texture. Smashbox never seems to disappoint me. a neutral or even a smokey eye should be a piece of cake with this palette! I use the eyebrow shadow pot by smash box. their stuff is really cool! I'm glad you liked this one Kim! I have it and its not one I reach for often for some reason. Someone told me that you have to kind of break off the top layers of the shadows for them to work well. Like breaking them in LOL! I need to use mine more. I'm pleasantly surprised they have a eyeshadow guide for monolids. I always had trouble finding how to's in putting make up on for monolids! I love that you say it's not too shimmery because as I get older I'm definitely staying away from shimmery and sticking toward matte. It's so tough because you posted so many great palates this week and I stopped buying palates a couple years ago because every time I dropped them in the bathroom they'd all break. :) But I think it's time to give them another chance. Nice post Kim! I always remember Ines de la Fressange saying that eyeshadow with too much shimmer could age anyone, even a young girl - she knows what she's talking about and I have to say, I agree with her. I'm always on the hunt fo shadows that shimmer without being over the top. It sounds like I need to try Smashbox! Omg Kim! This is the perfect eyeshadow palette. EVERYTHING is so pretty and wearable! 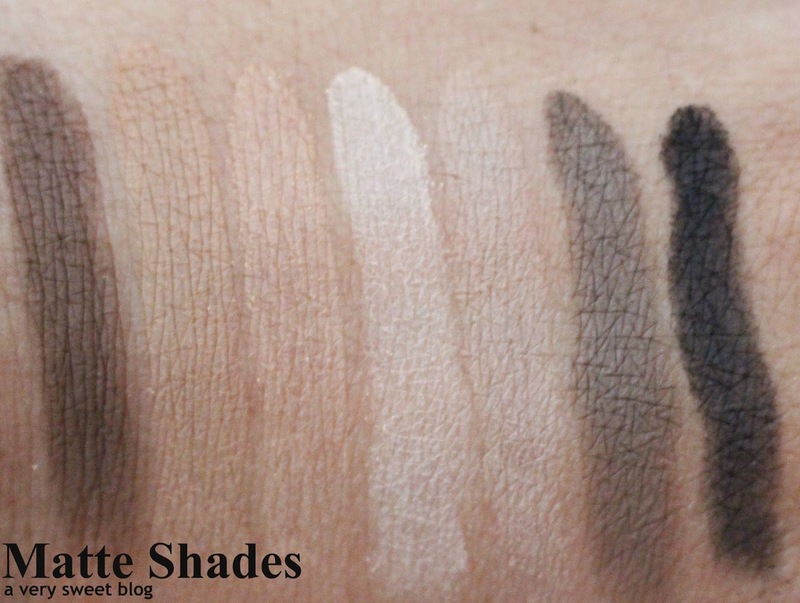 Great post and images, the swatches look great so i'll have to try this! Of course it's super sweet! I looooove Smashbox! The products are awesome and I love that they're comoletely cruelty free!!! Thanks for sharing, love! This is great for everyday wear! I love it. OOh this palette has a nice selection of colours. I almost never wear shimmer shadows though - but it's nice to be able to mix it up a bit! This is another palette I hear positive reviews! It looks like a great palette and the colors are really pretty! It's nice that Smashbox provides a tutorial in their product. There are so many selection of colours on this palette. What a nice palette. I love all the different colors from shimmery to matte. I'm a fan of Smashbox, will definitely be adding this to my list. I'm so glad you like this palette too, Kim, it's fabulous isn't it? I actually started using more eyeshadows thanks to this palette. The shimmer shades are perfect, I don't look like a blast from the 80's using this palette. Even when i dabble into my candy color eyeshadows i always have my brown and earth tones. They are my defaults. Thanks for sharing Kim and Happy New Year! I've never been a huge eye shadow fan, but these colors definitely intrigue me. Have to try these out. When it comes to eye makeup, I could always use some direction! Love that they included a clever little guide! I love the eye chart! Totally helps a noob like me.